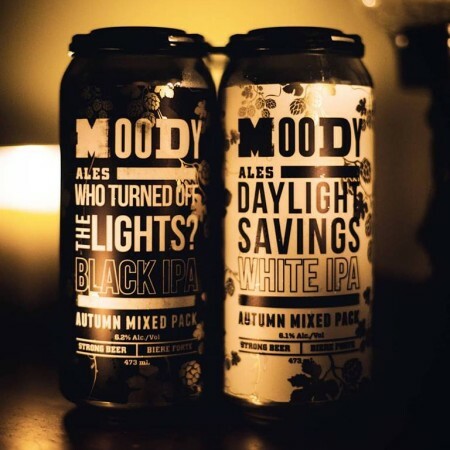 PORT MOODY, BC – Moody Ales has announced the release of a pair of new beers inspired by the recent annual switch from daylight savings time back to standard time. Who Turned Off The Lights? – Dank and full of flavour, this Black IPA is generously dry hopped with Chinook and Cascade. Chocolate and coffee flavours combine with the pine of the hops to make this darker IPA highly drinkable. Daylight Savings – Our newest New England inspired White IPA features wheat, toasted oats, and flaked barley to create a smooth mouth feel. Hopped with Citra, Centennial, and Amarillo, this IPA boasts flavours of stone fruit, grapefruit, and sweet melons. Both beers are available now at the brewery in an Autumn Mixed Pack featuring two 473 ml cans of each, as well as on tap in the tasting room, while supplies last.